The free app will allow neighbors to view live feeds and request recordings from each other’s security cameras. Outdoor home security cameras are great crime deterrents, and they’re also useful for providing forensic evidence to help police apprehend criminals who aren’t deterred. But no matter how many wide-angle lenses you deploy around your house, you won’t be able to capture everything that goes on. Service provider Vivint Smart Home thinks it has a solution: A free app called Streety that lets neighbors share—with permission—live video feeds and recorded video clips from their respective home security cameras. Vivint plans to offer Streety this spring to everyone in the U.S. and Canada. You won’t need to be a Vivint subscriber or even purchase Vivint’s cameras—or own any camera at all, for that matter. The objective, according to Clint Gordon-Carroll, VP and general manager of cameras at Vivint Smart Home, is to build stronger communities. Neighbors who choose to participate will be able to form a private network of security cameras inside a 300-yard radius. The boundary is intended to ensure that requests come only from nearby neighbors. A third-party verification service will match the identities and addresses of each Streety user. The camera owner can review each request for video and approve or deny it. Criminals are becoming savvy to the presence of security cameras, hiding their faces as they approach your porch to steal a package, for example. But with multiple cameras monitoring the scene from different angles, that practice will be much less effective. Using Streety, neighbors will be able to post messages and videos to help each other investigate break-ins, vandalism, stolen packages, and other incidents. Once a camera owner approves a request, Streety will generate a recorded clip that can be used to gather additional information. 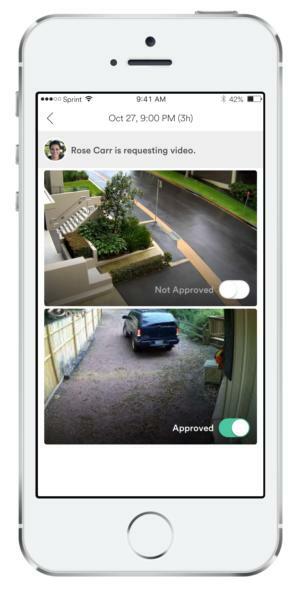 Streety users will also be able to stream live video—from Vivint cameras, at least—to monitor their children playing in a friend’s yard or to keep an eye on a neighbor’s home while they’re on vacation. Vivint developed Streety as an open platform and is inviting other camera manufacturers to integrate the app into their own products. The company plans to release the app sometime this spring. Video doorbell pioneer Ring has a similar program called Ring Neighborhoods. Correction: This story originally reported that Ring Neighborhoods was limited to Ring's customer base. Anyone can join the program.